The next step in scuba diving, the PADI Advanced Open Water Diver course is for certified scuba divers who just can't get enough of the open sea. In this two day course, you'll submerge yourself in the tropical paradise of the Bali Sea, completing five open water dives. Designed to build advanced skills, these dives will take you down to a maximum depth of 100 feet to test your abilities and showcase incredible beauty. Trained by a certified dive instructor, you'll undertake elective dives from night diving to drift diving, and earn your PADI Advanced Open Water Diver certification. • Learn advanced skills and techniques of scuba diving. 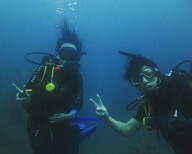 • Complete five open water dives in the Bali Sea. • Earn your PADI Advanced Open Water Diver certification. Travellers are required to be certified as PADI Open Water Diver before booking this course. On the first day of your scuba diving course in Bali, you'll begin with a small refresher to test your prior skills in scuba diving. Soon, you'll take the step forward and embark on two mandatory open water dives: the navigation dive and the deep dive. You'll head out from the island to specific dive sites and swim down 60 feet deep with your dive instructor. You'll focus on developing advanced skills and techniques, while exploring a wide array of the marine life like crabs and sea turtles. The day's session ends by late afternoon. You can spend the rest of your day at leisure. Today, you'll select from a range of electives like the fish identification dive, the drift dive or the wreck dive. Depending on your elective, you'll once again head out from the island to specific dive sites and swim down 100 feet deep with your dive instructor. You'll focus on developing niche skills and techniques in your area of specialization. At the end, you can take some time to simply relax and explore the fascinating topography of the ocean floor. Back at the dive center, you'll end the day's session with the paperwork to receive your certification. Your trip ends here.